Harry's Blended Blues, Folk, Indian Classical, Gospel & Groove. All General tickets are sold out. Only the student tickets left. If you are a student with a valid student id., then proceed to read the details below. Hello internations blues fans. Thanks for checking this event out. i am copying the details below for your reference. 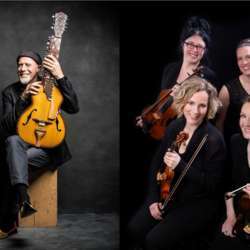 Count on Harry Manx to switch it up and tailor his exotic sounds to a union with a string quartet. Known as the mysticssippi bluesman, Manx has delivered an array of projects built on the foundation of his immediately identifiable Indo-blues sound and much of it created with his 20 stringed Mohan Veena. Manxs journey is unlike that of any of his peers and he continues to open doors that are as unique as they are exciting and challenging for the listener. :"
I hope to see you in this first monthly group activity event of the new year.